Latino Detroit is a weekly publication serving the Latino community of Detroit and throughout the State of Michigan. WBC boxing referee Frank Garza is a contributing columnist for the publication. 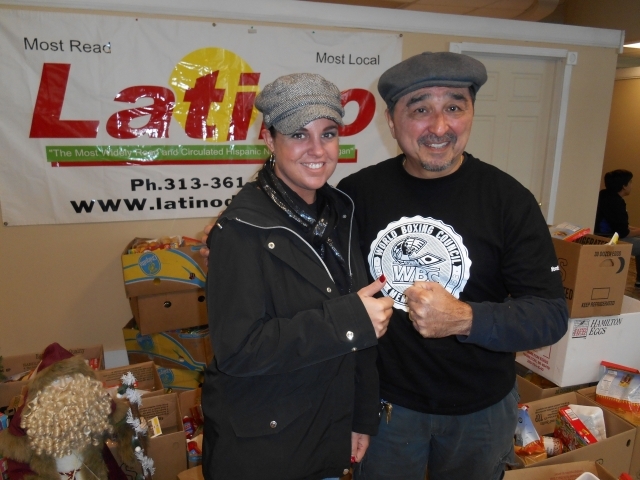 Over the years Frank has donated his monies and time in the name of the WBC Care Program for the annual Latino Detroit Food Drive. Joining Frank this year to assist Frank as she has done for several years at the WBC and NABF Conventions is his daughter, Drayonah. "If memory serves me right the first year publisher Elias Gutierrez started the program we assisted 40 families. This year through a combined effort of everyone here and friends that have joined us Elias was happy to announce that we will be helping 600 families." said Garza. When asked "Why?" Garza responded, "I was very fortunate to have parents who believed in the three theological virtues of faith, hope and charity. To believe in God, to seek heaven and to seek rest in giving." Above: Drayonah and Frank at the Latino Detroit offices getting the food baskets ready.